Add a little extra fun to excursions with your little one: take the Cosatto Supa Go Stroller. 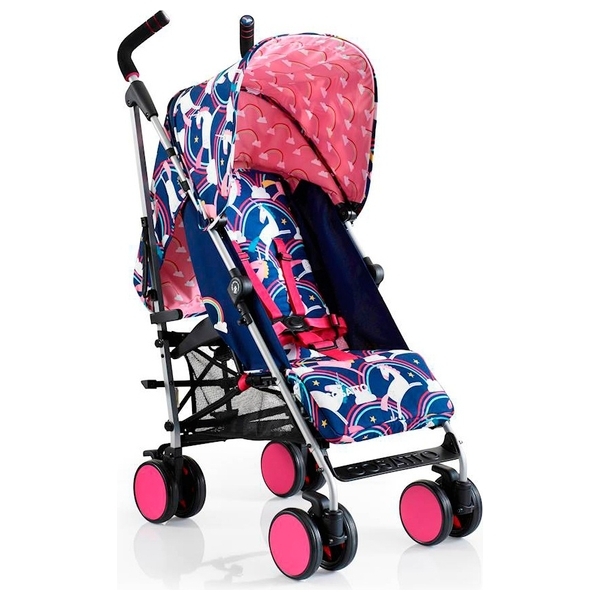 Streamlined and lightweight, the Supa Go features Cosatto’s signature playful patterns for fun on the run. Suitable from birth all the way up to 25kg, the Cosatto Supa Go Stroller adjusts to suit you and your growing little one. The forward- facing seat reclines to 4 different positions, including one suitable for newborns—and you can adjust the recline using only one hand. An adaptable leg rest lets little ones put their feet up and enjoy the ride, while the adjustable handle height helps parents to steer in comfort. The Cosatto Supa Go Stroller has a super light and super strong aluminium frame. The carry handle and compact umbrella fold are perfect for smaller cars, public transport and all kinds of tight spaces. Lockable front swivel wheels offer parents the manoeuvrability they need, while the 4-wheel suspension keeps kids travelling bump- free over uneven surfaces. The raincover andUPF50+ hood make the Cosatto Supa Go Stroller a perfect shelter in any weather—the hood even has a handy viewing window so you can keep tabs on tiny. The spacious shopping basket has plenty of room for baby’s belongings, while the seat covers are easy to pop off for cleaning. This streamlined stroller is perfect for families living life on the go.